of September untill the end of October Studios are 30 € per night. For all other dates through the whole remaining season Studios are for 40 € per night when you book from our website. 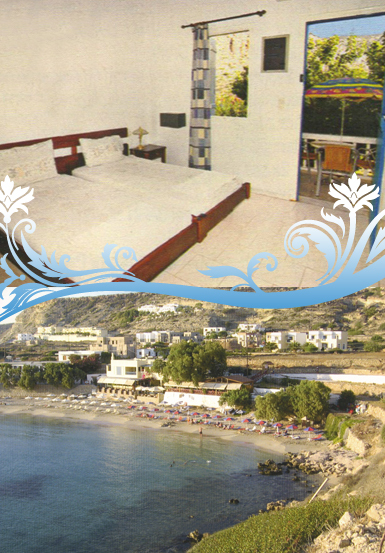 The Α - Class studios "Blue Swan" are located at the region Lefkos in Karpathos. Situated on a quiet side road, Blue Swan Studios and Taverna is within walking distance (100m) of the beautiful beach at Lefkos in Karpathos. The amphitheatric position of our building offers one of the most enchanting panoramic views over the village and the gulf of Lefkos. The amazing sea view, the colours of sunset and sunrise from the independent verandas of the rooms, will offer you a unique experience in Karpathos. Our establishment consists of 12 studios (double and triple) build according to the traditional Karpathian architectural lines, including a garden and olive trees. 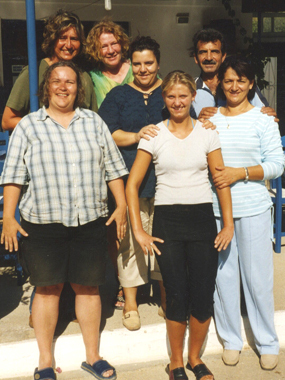 you satisfied and happy when you are visiting Karpathos. Our guests can enjoy, breakfast (upon customer request) drinks of any kind as well as Karpathian, Greek and International cousine during the opening hours of our own reatsurant. Also for our guests only there is a private parking area for parking your car or bike. time to all its guests. Use our reservation form here. Situated right underneath our studios overlooking the sea is our own taverna. Own by our own family, it offers a truly special and unique setting where you can enjoy some quality moments. All our studios are served directly from our taverna. The views from our taverna are both magical and inspiring, and its peaceful location means that the time spent here with all of us will be one you will always remember and cherish for ever. and service, our guests will enjoy a wonderfull selection of Karpathian cuisine, fresh fish cooked on charcoal, Greek & International specialities. You can also enjoy a great selection of mezes and traditional ouzo, as you sit back and soak up the colourful and traditional atmosphere here in the village of Lefkos. All our apetizers and meals are carefully prepared using the highest quality of ingredients and products. Using some very unique and traditional recipes, we are sure you will find our selection of meals one that will have your taste buds buzzing with delight. 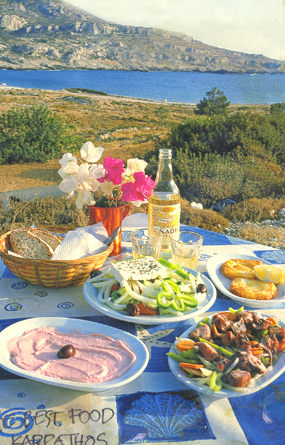 a selection of Local, Greek and Foreign wines as well as traditional Greek desserts. Our Taverna has been beautifully decorated, offering you a very comfortable and interesting setting with which to enjoy your meals. We are open all day long, so during the summer, you can take a seat outside watching the sea and enjoy your meal or your drink. on offer. 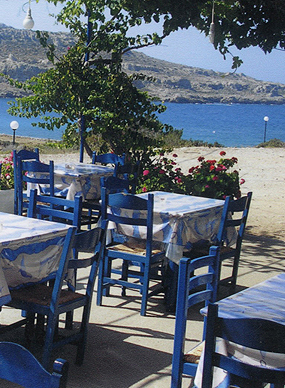 After a relaxing day at the beach, or one spent exploring the various magical regions of Karpathos, our taverna is the perfect destination for you to come and enjoy a tasty meal in a relaxed and comfortable atmosphere. Your children will also be able to play freely and safe all around our beautiful garden. will also be able to offer you our warmest welcomes and most sincere hospitality when you visit. Whether you are planning to stay in our Studios, or are passing through, we hope you will take the time to stop by, and allow us to offer you our warmest welcomes, and a selection of cuisine that we know you will both enjoy and appreciate. We can also arrange for functions and gatherings such as weddings and baptism receptions to take place at our taverna.